SIBM Pune being a premier B-School enjoys the confidence of the industry for producing managers of the highest caliber with a perfect mix of business acumen and unique pedagogic approach in preparing trained management professionals. The Campus Recruitment Programme (CRP) at SIBM Pune gives an opportunity to the institute to showcase its talent pool to the corporate world and for corporates to reiterate their confidence in recruiting from the institute. The placement track record of SIBM Pune has shown a positive trend ever since its inception as the Institute focuses on the holistic development of students. 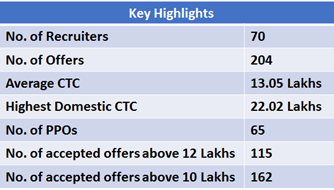 SIBM Pune announces successful completion of an exemplary campus recruitment season, 2014-15. The institute delivered by attracting leading companies which offered coveted profiles to the students. Increasing number of PPO/PPIs : The excellent quality of the students translated into a stellar placement season thereby generating long term association with various organizations. This has also been proven by the increase in the number of Pre-Placement Offers (PPOs) / Pre- Placement Interviews (PPIs) bagged by SIBM Pune’s students through Summer internships and various national level competitions. SIBM Pune continues to celebrate diversity with regard to sectorial offerings with students getting an opportunity to work in profiles from a variety of organizations across the diverse sectors. The companies that came to the campus offered diverse profiles across functional domains like Investment Banking, Project Finance, Equity Research, Corporate Treasury, Business Advisory and Strategy, Compensation & Benefits, Industrial Relations, Organization & Talent, Sales, Marketing, SCM Consulting, Logistics, Operational Research and Technology Advisory. 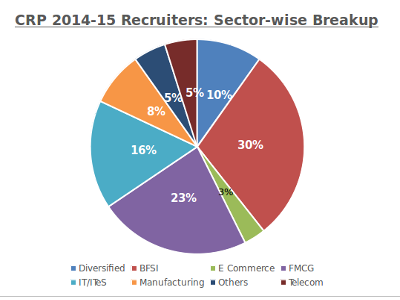 CRP 2014-15 saw a good number of new Organizations reinforcing their faith in SIBM Pune. The companies that participated in CRP for the first time included Amazon.com , SnapDeal, LAVA International Ltd., Dell India , Syngenta India Limited, ZS Associates, Maersk GSC, Credit Suisse, DE Shaw and Co. to name a few.